Open studio – work in progress is not an exhibition in the classical term of the word. It is rather a presentation of artworks in progress, an overview of the artistic reflections that Mohamed Arejdal has been able to develop during his residency as part of the research, experimentation and production project summer’s lab, initiated by Le Cube – independent art room. The base represents a stable world, and the top is metaphorical of a world in movement. Inversing the economic and political predominance of the United States, the map of the world of Arejdal is redrawn and diverted, the human geography in reconstruction, provoking reflections on power. While keeping a poetical aspect with the representation of the Moroccan traditional mill, Arejdal delicately approaches the question of unbalanced distribution in the world. Crank is a call to “feed the world”. 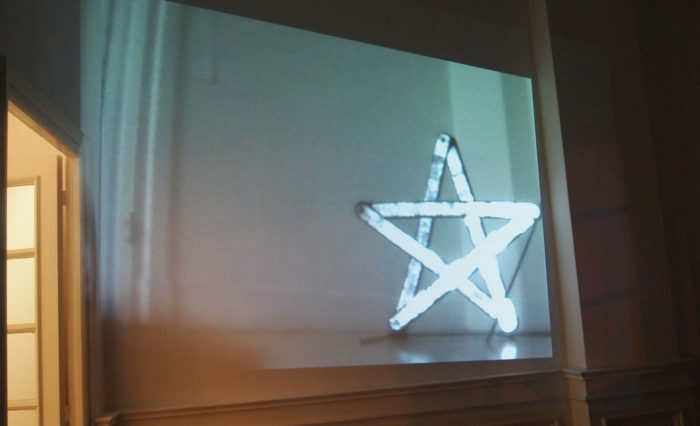 Greenislam is an experimentation that involves an installation of objects, lighting and projection. Acting like a warning triangle, it signifies security, danger and breakdown. A form transformed into a star, that which appears on the Moroccan flag. That star –being a religious symbol that represents the color green as a sacred element of the Islamic aesthetic- plays between presence and absence, reality and the virtual. The work unveils an ideology that manipulates Islam for a political project. 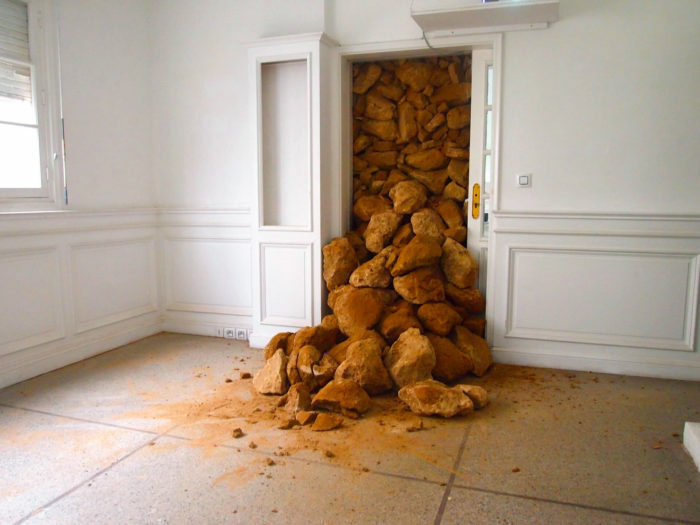 Azro N’Tmazert : an installation of stones and a projection. The artwork Greenislam is installed in the middle of a room that is closed by stones. The spectator can only see the illuminated object through a projection caught with a camera in the closed chamber. What do we see really? What is it that remains an imagination and interpretation? It is a work of the “inside” and the “outside”, the “local” and the “global”.